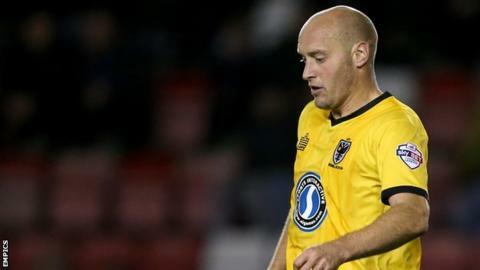 Already-relegated Cheltenham Town ended their 16-year Football League stay with a draw at mid-table AFC Wimbledon. Durrell Berry put the Robins ahead against the run of play when his low shot went in off the post. But the Dons levelled just before the break, Jack Smith heading in from close range after good work by Alfie Potter and Adebayo Akinfenwa. Wimbledon had the better second-half chances, but Cheltenham goalkeeper Trevor Carson made some fine saves. His best stop came when he tipped substitute George Oakley's close-range shot on to a post - a save that ensured Cheltenham did not finish bottom of the table on goal difference. "We could have won by four but we drew 1-1, so that sums up our season. "There's a lot right with what we're doing; we attack teams, the way we create chances is brilliant- how many chances that get created against us is low. But we've just lacked the ability to score goals and that's ended up costing us. "We're a very, very good team, but we've been short of a few things. There's been a lot of things in my recruitment that I've got wrong during the second half of the season that probably cost us. It wasn't through any fault of my own but the availability of the players and that has cost us." "I needed to have a look at the lads, see which ones I think are first-team material, which ones have got enough of a game to make sure that we're in the top few of the Conference next year. "Harry (Williams) was unlucky, I thought he could have got a penalty. I don't think referees have been giving us the penalties we've deserved and that was another one. "(The squad)'s going to need a pretty big change around and that's what I'll do." Match ends, AFC Wimbledon 1, Cheltenham Town 1. Second Half ends, AFC Wimbledon 1, Cheltenham Town 1. Craig Braham-Barrett (Cheltenham Town) is shown the yellow card. David Fitzpatrick (AFC Wimbledon) wins a free kick on the left wing. Omari Sterling-James (Cheltenham Town) wins a free kick in the attacking half. Corner, AFC Wimbledon. Conceded by Trevor Carson. Attempt saved. Alfie Potter (AFC Wimbledon) right footed shot from the centre of the box is saved in the bottom left corner. Substitution, AFC Wimbledon. George Oakley replaces Adebayo Akinfenwa. (Cheltenham Town) wins a free kick in the attacking half. Corner, AFC Wimbledon. Conceded by Jack Deaman. Substitution, AFC Wimbledon. Sammy Moore replaces Jack Smith. Foul by Jamal Lawrence (Cheltenham Town). Substitution, Cheltenham Town. Jamal Lawrence replaces Bobbie Dale. Substitution, Cheltenham Town. Omari Sterling-James replaces Harry Williams. Attempt missed. Tom Beere (AFC Wimbledon) right footed shot from outside the box misses to the left. Substitution, AFC Wimbledon. David Fitzpatrick replaces Craig Tanner. Attempt missed. Jake Reeves (AFC Wimbledon) right footed shot from the centre of the box is close, but misses to the right following a corner. Corner, AFC Wimbledon. Conceded by Durrell Berry. Corner, Cheltenham Town. Conceded by Jake Reeves. Attempt missed. Alfie Potter (AFC Wimbledon) left footed shot from the centre of the box is too high. Attempt missed. Craig Tanner (AFC Wimbledon) left footed shot from outside the box is close, but misses to the left. Corner, AFC Wimbledon. Conceded by Craig Braham-Barrett. Substitution, Cheltenham Town. James Bowen replaces Wes Burns. Attempt missed. Adedeji Oshilaja (AFC Wimbledon) header from the centre of the box is too high following a set piece situation. Foul by Harry Williams (Cheltenham Town). Craig Tanner (AFC Wimbledon) wins a free kick in the defensive half. Second Half begins AFC Wimbledon 1, Cheltenham Town 1. First Half ends, AFC Wimbledon 1, Cheltenham Town 1.